I've been following the tale of the Dupont Renaissance (located here) since I returned to DC in early 2004. Since the construction blocked part of the street where I park my car when I go to the gym, I watched the development unfold for the better part of two years. Originally a two story apartment building, it was renovated by Adams Investment Group; two floors were added to the two-story building during the renovation, delivering 16 condos in December 2005. Dupont Renaissance was a pretty small project compared to other projects in the District in the period. However, one reason I followed it - besides the parking inconvenience - was that it served as a microcosm of the condo bubble [see below]. The District recorded 19 sales transactions (including three flips) through the end of April 2007. 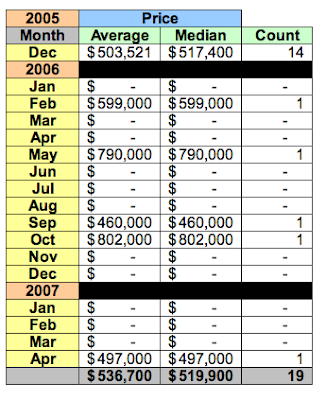 As the table above shows, 14 condos closed in December 2005 and another in February 2006 [a flip]. Five units were for sale as soon as the hurricane fences came down. By the end of March 2006, 11 units were for sale. In other words, more than 2/3 of all units sold were for sale again within three months of delivery. The last time I checked, about two weeks ago, there are still 7 lock boxes hanging on the fence. If one assumes that all occupant/owners have taken advantage of the District's $60,000 homestead exemption, then only 6 of the 16 units are occupied by their owners. DC6394233. Unit #203: 1/1. "2 YEARS CONDO FEE PAID BY SELLER"
Both units closed in December 2005. I first collected data for this post in late May; since then, unit #203 lowered its price $5000 to its current price of $450,000. Unit #101 flipped in February 2006, two months after it first closed. Unit #204 flipped in September 2006; it, too, first closed in December 2005. Ditto unit #102, which was flipped in April 2007. Originally offered for $529,000, that "investor" settled for $497,000. If nothing else, these three flips show the profit curve has a negative slope, omitting any consideration of carrying and transaction costs.